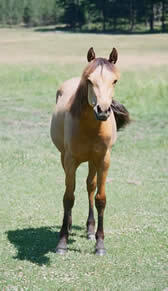 “Skylar” is a well put together buckskin colt with a people loving temperament and a well balanced body. 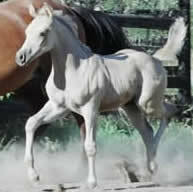 Put that together with some extremely nice movement and watch out when this colt hits the show ring! Skyler represents the excellent quality performance horse that comes from the great cross of Arabian and Quarter Horse blood. Buckskin color is a nice finish touch! 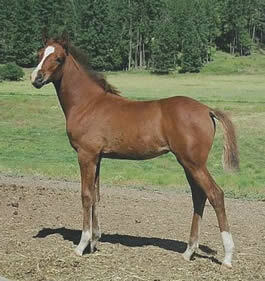 Skylar's sire, High N Command is an up and coming NW perlino stallion. Commander’s first foal crop in 2004 produced some outstanding babies. He easily and consistently passed on his well-shaped head, long arched neck, nice shoulder, short back and substantial hip. 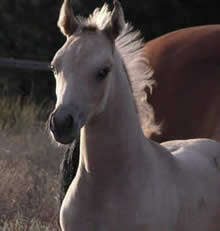 Commander’s easygoing temperament wonderfully compliments the Arabian intelligence in his half Arab foals. Skylar’s dam, Twice Blessed ( HV Fire Beau x EM Tifla Hilal) is an elegant little bay Arabian mare that made her mark in the show ring years ago. 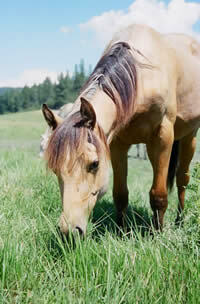 A nice moving mare who has passed her style, beauty and movement on to her son. Proudly bred by Laura McConnell and currently owned by Diana Morales. Currently in reining training. 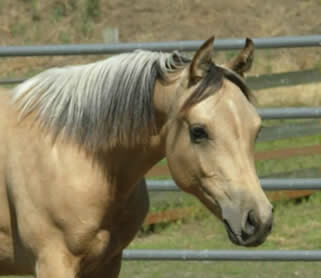 “Joey” is a performance packed buckskin filly. She is superbly suited both physically and genetically, to become a champion performance horse, a substantial endurance competitor, a dynamite cutter/reiner or a superb Sport Horse. Quiet and calm she is as sweet as she can be. Now owned by her teenage friend, Adeena. See our Family Page for current pictures. 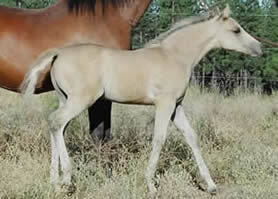 Kalmiki was bred to run! She will enter our heard as a future race contender and already has the look of winners in her eyes! 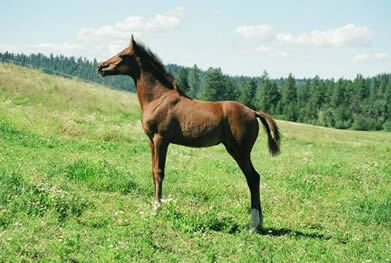 Kalmiki's sire was a race horse himself and carries the athletic blood of his sire, Samtry, and grandsire Sambor. Wild Win, Kalmiki's dam, raced back East under the training of Lynn Ashby, and had a respectable winning career.